I actually don't feel like saying much about this, but I'm due for a post. The Future of Stuff was a fun mini conference about.. you know what. I learned a few interesting things from the speakers even though I had heard a few of them (Mary Huang and Aminimal studio) only a few weeks ago. Alex Hornstein talked about his interest in how independent designers make successful products, showing a few case studies. How exciting to hear about the logobot which is a physical robot version of the turtle in logo and spikerbox which is an at home neurobiology kit. He was really excited about products which brought the cost of traditionally expensive machines to an affordable price. Jessica Rosenkrantz & Jesse Louis-Rosenberg spoke about the Nervous System aesthetic and their generative design philosophy. Graphic designer Richard The showed some examples of his work. It was interesting to see logos which used interactivity to reinforce concepts. He also showed a few examples of parametrically generated graphics which were used as constantly changing but recognizable logos. I was especially interested with what the final speaker, Marius Watz, had to say about coding and parametric art and design. It's better that you go look him up because my summary of his presentation won't be as interesting as his own words. Mostly I learned that programming is something that I should probably learn. oh, and that Lasersaur is working to make affordable laser cutters a reality. This tutorial is going to show you how to dye a 200 yard skein of plain wool to have a long, slow gradient. This sort of coloring is popular this season in a lot of trendy sweaters from Urban Outfitters. 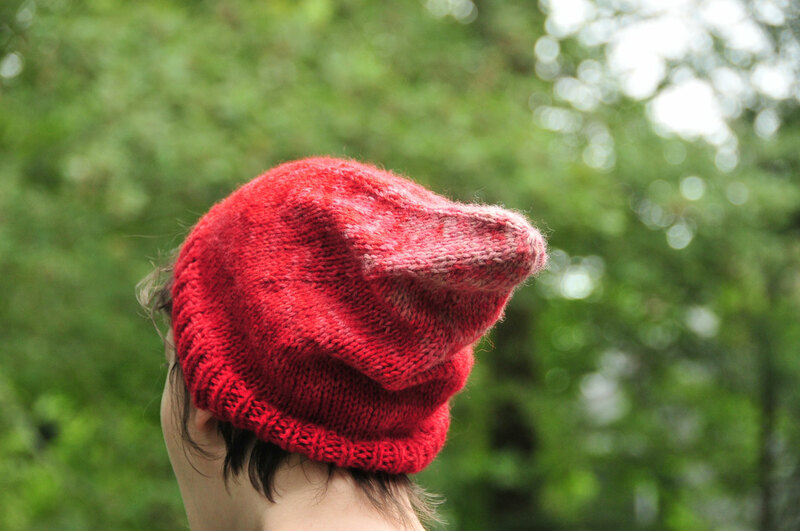 It is also similar to a lot of self striping yarns, just a bigger stripe. Here is a picture of a shawl that I made using some wool that was dyed with this technique. You can see that the gradient is not entirely smooth, it is kind of variegated, which I think is a nice effect.This is because the wool is essentially tie dyed. 2-3 packets of kool-aid in your favorite color. Rubber gloves, unless you don't mind chromatic fingertips. And roll it into a ball. 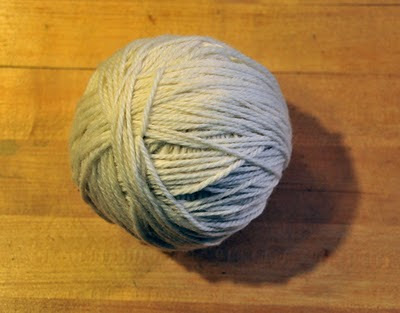 Don't wrap loosely, make sure there is some tension on the yarn as you wrap. 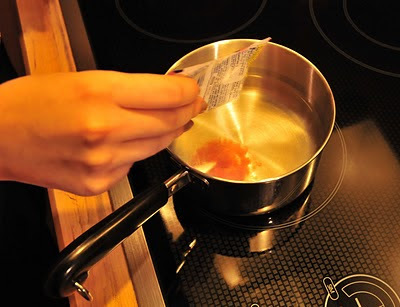 Put about 1.5" of water into your pot and add a packet of kool aid. Heat the mixture on the stove until it is steaming. 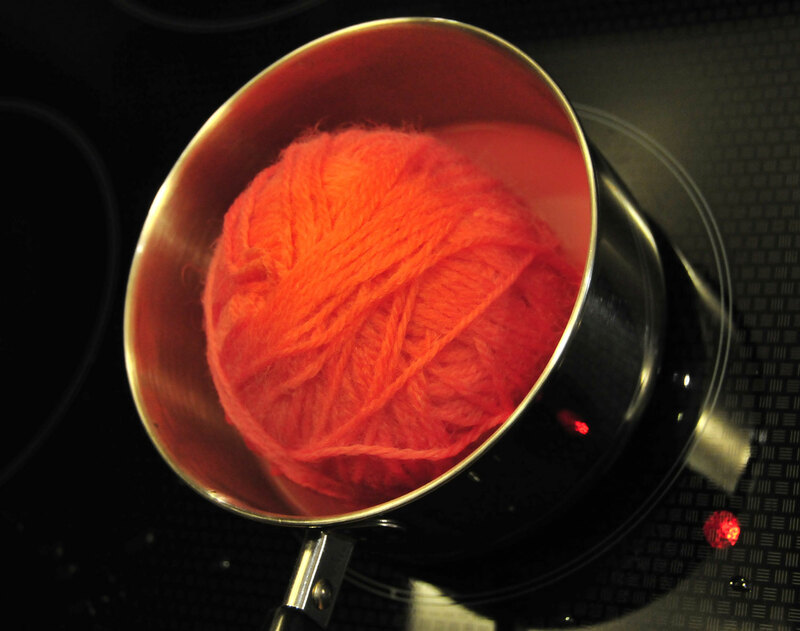 Add the ball of yarn to the hot pot. Use the spoon or your hands to move the ball around and to cover all sides with dye. You will know when to take the yarn out of the pot because the color will be sucked out of the liquid and into the fibers. The kool aid water will be almost totally clear. Take the ball to the sink and run water over it until the entire ball is soaked. 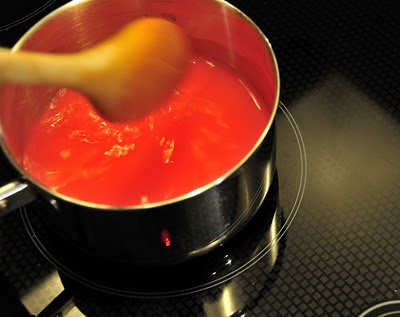 Fill the pot again, this time with 3" of water and 1 pack of kool aid. Heat the pot until the liquid begins to steam. 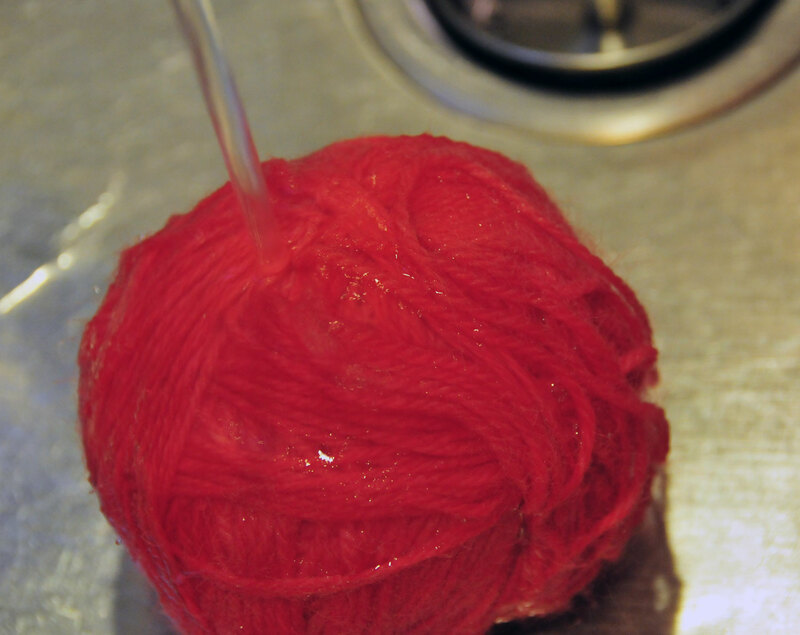 Put the wet ball of yarn into the pot, this time, the capillary action of the wet yarn will draw the dye deeper into the ball. Make sure to roll the ball around and cover every side with dye. When you feel you are done, take the yarn out of the pot and rinse it under cold water. 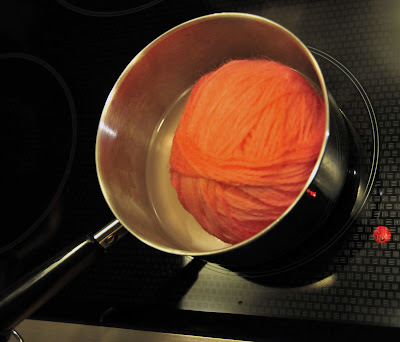 When the ball cools, you can wind the yarn into a skein. you will see the inside of the ball slowly getting lighter. Take the skein and wrap it in a towel to take out some of the moisture. 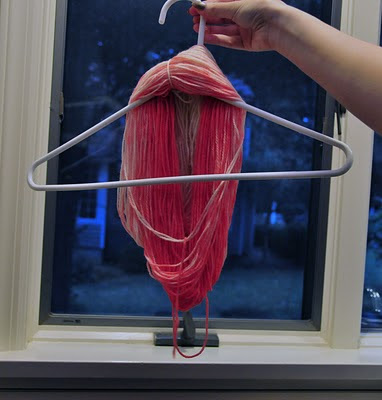 Hang it on a hanger to dry. There are a lot of projects that you can do with this yarn. 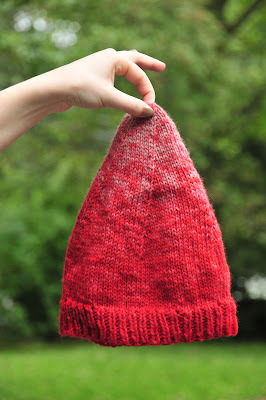 some of you may remember the ironic gnome and some chrysanthemum hats that I made with yarn dyed this way. 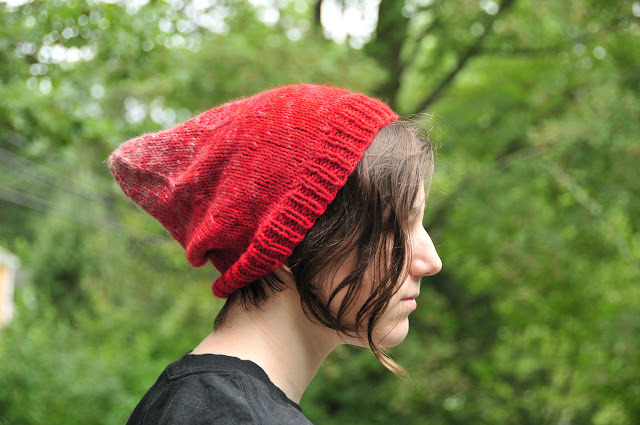 This uses black Rit dye on aqua wool instead of kool aid. 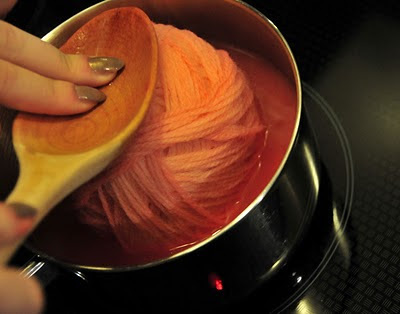 This uses cherry kool aid with a bit of orange on pink yarn. I hope this is useful for everyone who has asked how to make the gradient. 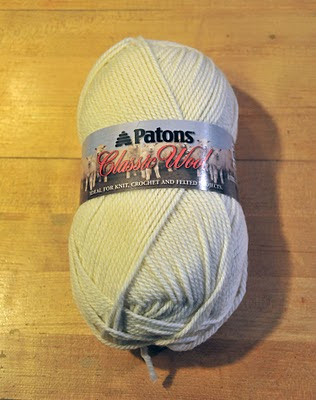 Please post pictures of your projects if you use this yarn, it will be a lot of fun to see what people do with it. I went to a meetup yesterday that was hosted by the Digital Design Therapy group about the possibilities of 3d printing. There were speakers from Shapeways and design studios which use digital media as part of their design and manufacturing. 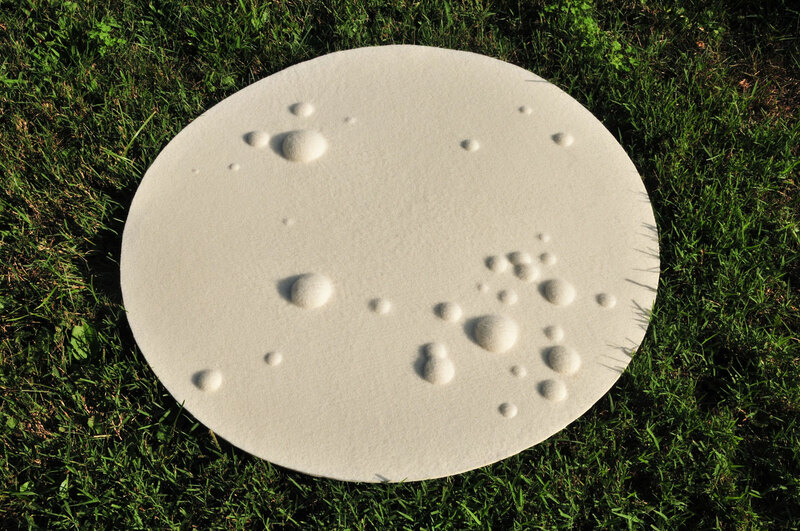 Though a lot of time was spent on the materials and capabilities of 3d printing, a few ideas on general design theory also came across as important. More and more, people want the freedom to design their own products. This is something that I have definitely been thinking a lot about lately. The democratization of design is kind of a threatening idea to me because its already hard enough to find work, but there is still a place for the professional in the future. 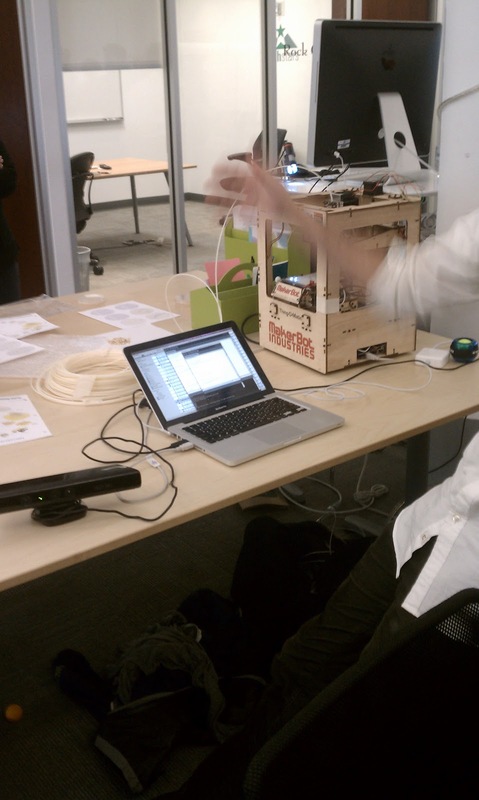 Mary Huang showed a few of her interfaces which are designed to give people the tools to make products interactively. Ddress, an app on the Continuum Fashion website is an interesting example of this phenomenon. She designed the interface to give users complete freedom to choose form, but consciously limited them to black fabric and a low poly pattern. This helps people make something that is unique, but still fits into an overall aesthetic. Like all manufacturing processes, 3d printing has unique properties and capabilities. Justify high cost by making things that cannot be made by other means. Thee founders of Aminimal studio spoke about their lighting and jewelry projects which take advantage of the printers' ability to make highly detailed, complex forms accurately. It just doesn't make sense to print something if it can be made cheaply using another process. Similarly, designers from The Future Future showed their jewelry, which uses the freedom of 3d printing to generate unique but similar pieces. Because there is no master mold, there is no reason to make only version of a product. All of the designers acknowledged the potential of this new technology to change the structure of manufacturing in a way that has not happened since the industrial revolution. I don't doubt it, and will be continuing to think about these new rules for design as we all should. 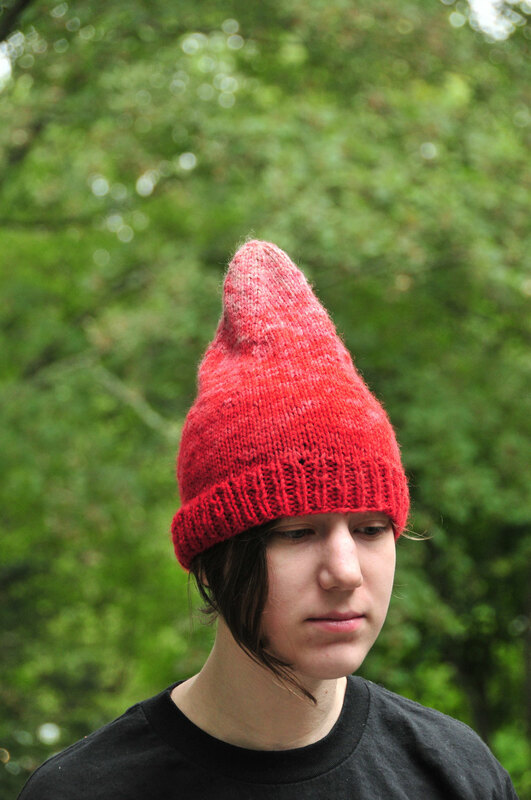 The Ironic Gnome hat is for hipster gnomes or people who like to sit out on the grass ironically. I used some hand dyed Paton's classic wool - less than a full skein. Round 11: *K8, M1 x 10. You have 90 stitches now. K16, k2tog x 5. Knit 2 rounds. K15, k2tog x 5. Knit 2 rounds. K14, k2tog x 5. Knit 2 rounds. K13, k2tog x 5. Knit 2 rounds. K12, k2tog x 5. Knit 2 rounds. K11, k2tog x 5. Knit 2 rounds. K10, k2tog x 5. Knit 2 rounds. K9, k2tog x 5. 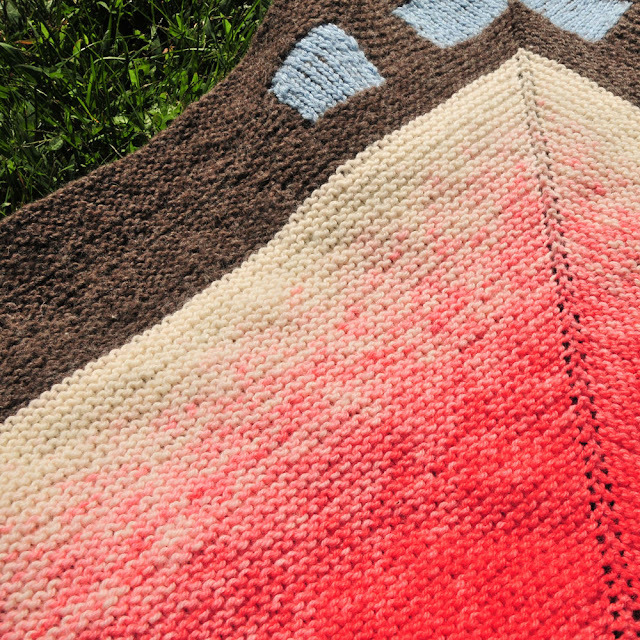 Knit 2 rounds. K8, k2tog x 5. Knit 2 rounds. K7, k2tog x 5. Knit 2 rounds. K6, k2tog x 5. Knit 2 rounds. K5, k2tog x 5. Knit 2 rounds. K4, k2tog x 5. Knit 1 round. K3, k2tog x 5. Knit 1 round. K2, k2tog x 5. Knit 1 round. k2tog x 5, Pull yarn through all 10 stitches, and break. 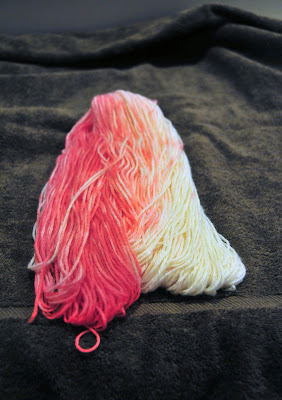 A tutorial on how to dye a long gradient in yarn will be up soon. For readers who are not familiar with the ongoing project, Feelology started as my senior thesis project. 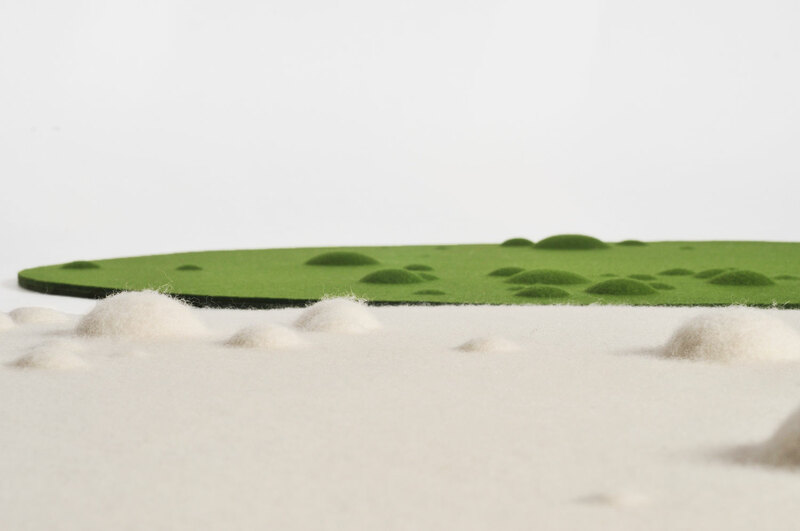 The goal was to create a set of products which keep us grounded in physical space even when we are preoccupied with our mobile distraction devices. As life moves further from reality and becomes inseparable from the internet and the computer, we cannot forget to satisfy our senses. Life is about more than touching a screen, it is about feeling and being aware of your environment. 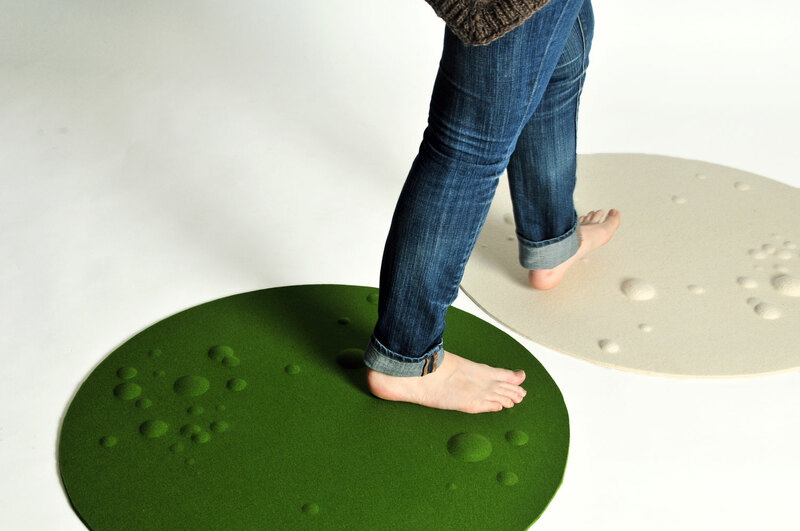 Since May, I have been refining the manufacturing process behind the feelology felt rug. 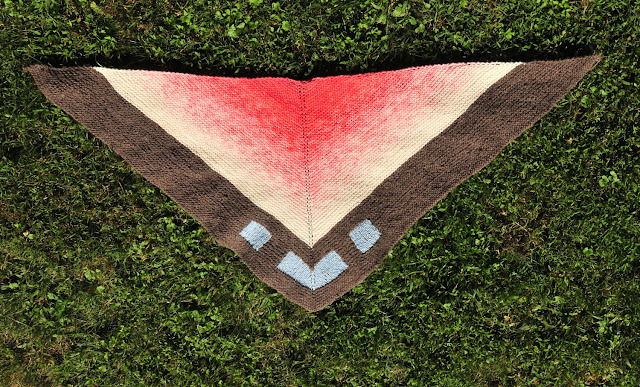 The first version was a rectangular shape made only with a felting needle and wool. This new set involves a bit of adhesive, but saves me strained arm muscles and pricked fingers, not to mention about 20 hours of work. 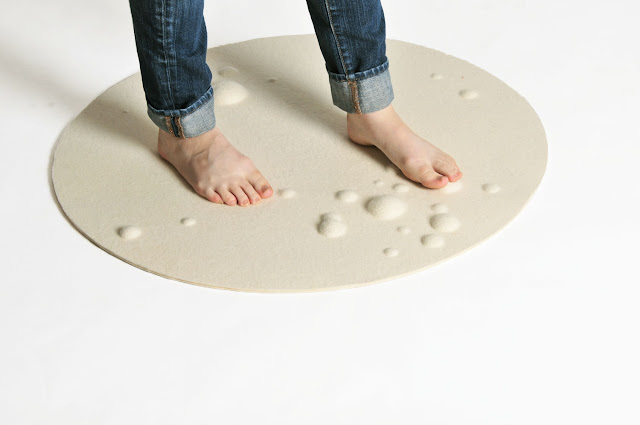 I made these new floor mats round because the shape works better with the bubble pattern. When choosing a layout, I wanted it to look natural and somewhat random, not arranged. I looked at the growth patterns of bacterial cultures in petri dishes, they tend to grow in clusters and in many cases have very beautiful patterns. 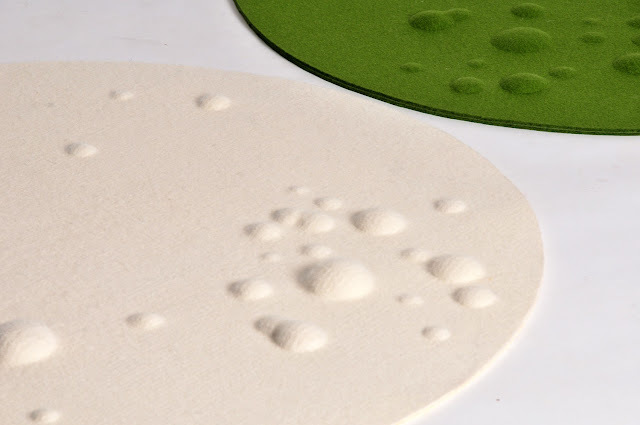 In order to make sure that I can definitely use colors other than white, I made one round with green felt. The color is really close to moss, which makes walking on it a lot like walking barefoot in my backyard. 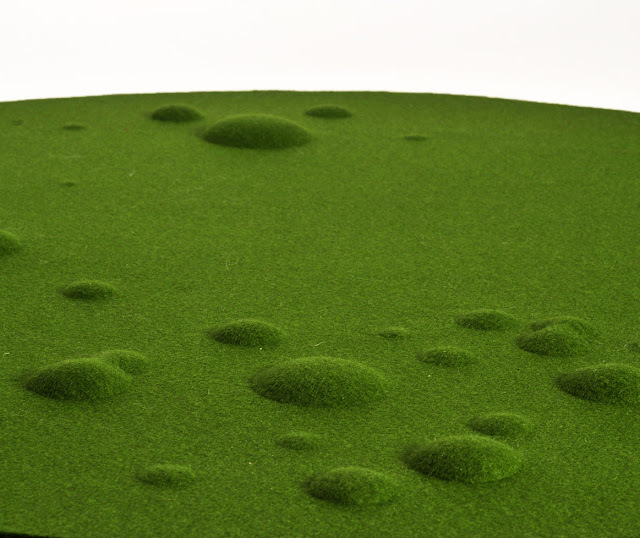 Moss is a very enjoyable texture memory for me. So check them both out on etsy, and remember that I am now able to fill custom orders in various colors and sizes up to 5'x8'. Check out this new pattern which is now in testing stage. 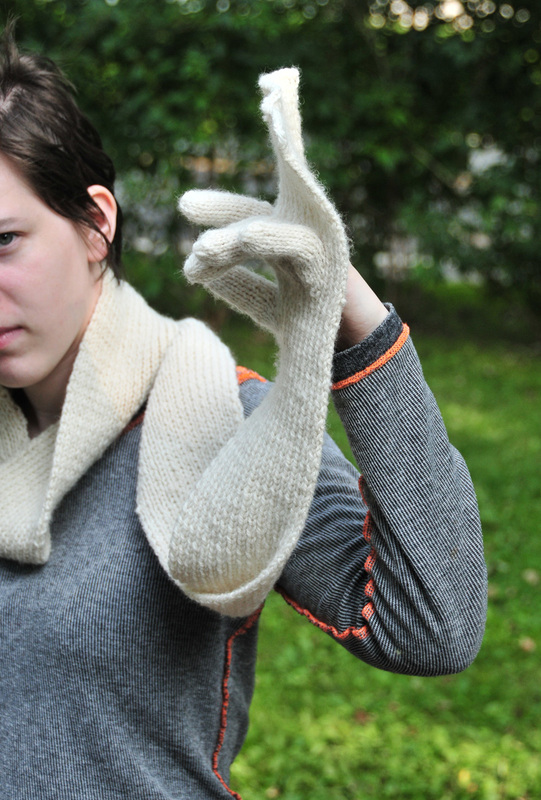 Did you ever wonder what would happen if a pair of gloves and a scarf had a child? What would happen if you just reached through your scarf every time your fingers were cold? Doesn't look like much - until you realize what those holes are for. They are for your cold fingers. So it has a built in glove. Its pretty useful actually. It reminds me of that scene in star wars where Han Solo is frozen in carbonite with his hands and face sticking out. 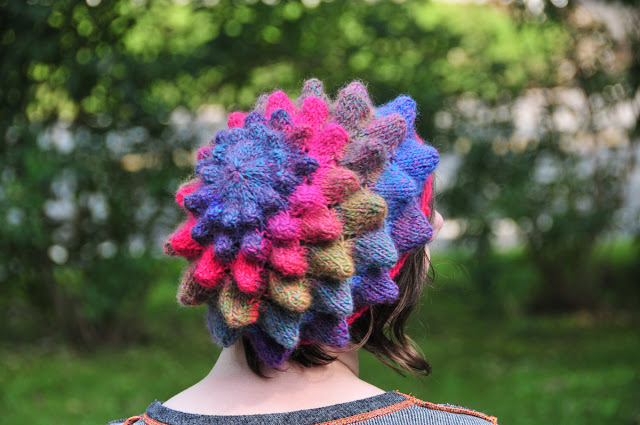 So yeah, I am looking for some test knitters because I am hoping to eventually sell this pattern for a small price. I'll be needing someone willing to make a man size too. Also this is my 200th post.Yay. So if you weren't thinking about making a spiky hat for yourself, maybe you will want one now. I made these two examples of chrysanthemum hats using slow gradient and self striping yarn. There was a sale on Lion Brand Amazing at Michael's this week, so I got a few skeins and made this. The colorway is called Mauna Loa. Someone stopped me on the subway and said it would look great for kids. A kid sized pattern coming soon, and you will be able to make it with only one skein of Amazing. 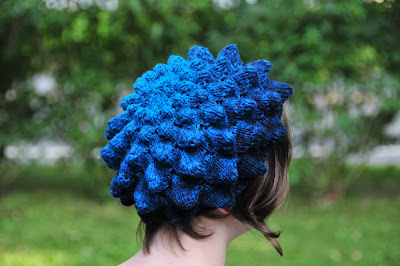 And here is a hat made out of one skein of hand dyed Cascade 220. 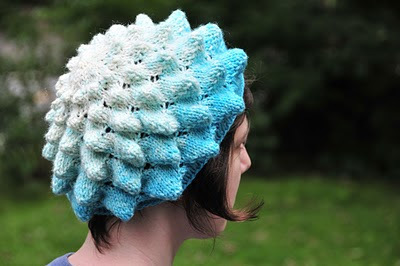 The yarn was originally aqua color which I wasn't really into. I figured out a way to dye a 200 yard gradient that would make a cool hat. If the process is repeatable, I'll be posting a tutorial here. I hope this was inspiring for someone and that you will buy my hat pattern. Each sale supports my yarn habit and goes towards yarn for new patterns for you.